Erik Nordlander of Nordlander Produktion (www.nordlanderproduktion.se) has used 18 Martin Professional Tripix 300™ LED (RGB) striplights to illuminate a newly rebuilt pedestrian bridge in Kramfors, Sweden in warm shades of white light and occasionally in dynamic color. Mill Bridge, a charming wooden bridge used by cyclists and pedestrians alike, is located just outside the city center of this northern Swedish town. 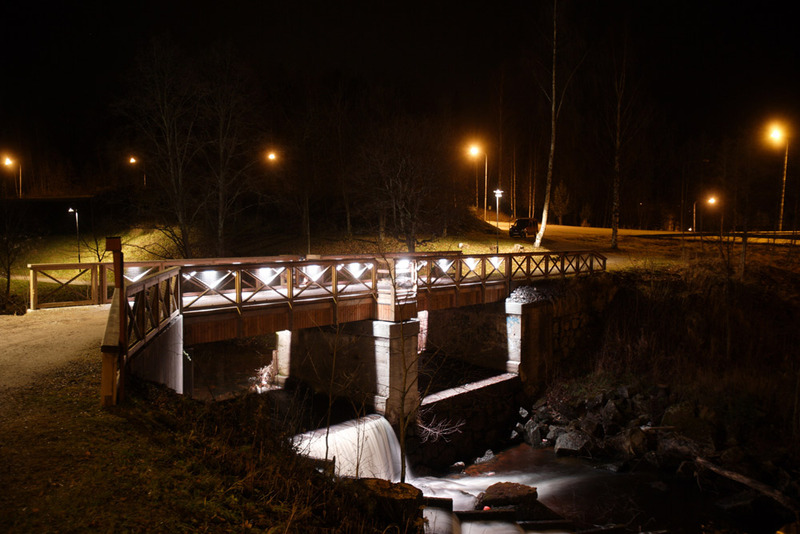 The Municipality of Kramfors sought not only to secure the bridge at night and increase safety across the popular pathway but looked to reveal the beauty of the bridge with an aesthetic nighttime illumination. Nine 300mm IP66-rated Tripix luminaires are mounted on the underside handrail on each side of the bridge. The Tripix 300 uses single lens tricolor RGB color mixing – a superior color wash system that projects a more uniform wash of color across a surface. “The Tripix has exceptional brightness and warm color, which is unique for a fixture of this type,” says Erik, head of Nordlander Produktion, a Martin Preferred Partner since the early ‘90s. The Tripix luminaires operate in stand-alone mode and besides lighting the bridge and pathway also wash a small waterfall just below the bridge, as well as a fish ladder. Installed in October of 2010, Erik reports no problems with the luminaires.